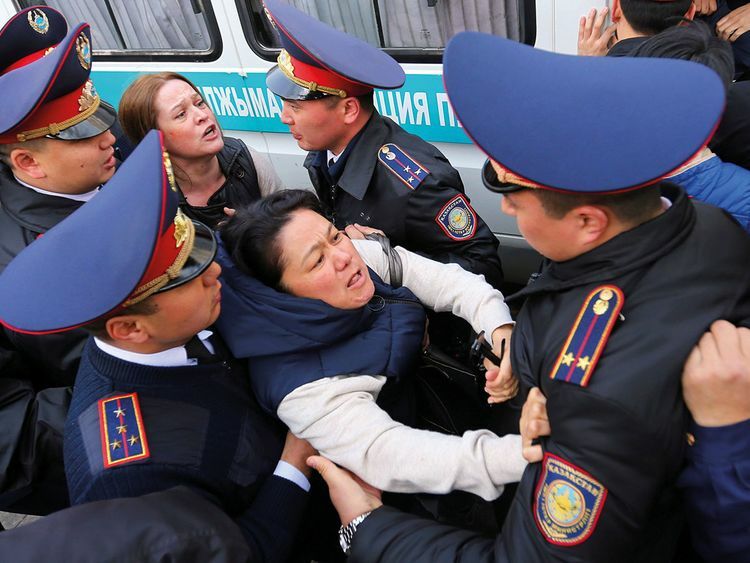 ALMATY, Kazakhstan: Police in Kazakhstan on Friday detained dozens of antigovernment protesters in the largest city Almaty and the country’s capital, days after leader Nursultan Nazarbayev’s shock resignation. Nazarbayev’s foreign-based opponent, Mukhtar Ablyazov, had called for protests on March 22, before the long-time president announced he was standing down on Tuesday. Around 30 people were arrested in Kazakhstan’s largest city, witnesses said. Those held did not have a chance to protest and appeared to have been identified by police before arriving at the spot in the centre of the city where a public holiday was being celebrated. Separately, local media said that “tens of people” including a journalist had been arrested in the capital, the name of which was changed this week from Astana to Nursultan, or “Sultan of Light” in Kazakh. Two men in the area where arrests took place in Almaty identified themselves as supporters of Ablyazov, who is based in France. Ablyazov’s Democratic Choice of Kazakhstan movement was ruled extremist by a Kazakh court last year in a move critics say has deepened the crackdown on regime opponents. On Thursday, police arrested several people in Kazakhstan’s capital protesting the decision to rename the city in honour of Nazarbayev. Career diplomat and political loyalist Kassym-Jomart Tokayev was sworn into office Wednesday after Nazarbayev, the only leader an independent Kazakhstan had ever known, stepped down after three decades in office. Kazakhstan’s senate appointed Nazarbayev’s eldest daughter Dariga Nazarbayeva as speaker, setting her up as a potential contender to succeed her father. Tokayev, 65, will serve out the rest of Nazarbayev’s mandate until elections due next year, though the former president retains significant powers. Public gatherings in authoritarian Kazakhstan are illegal unless they receive permission from local authorities, which is almost never provided in the case of political demonstrations.